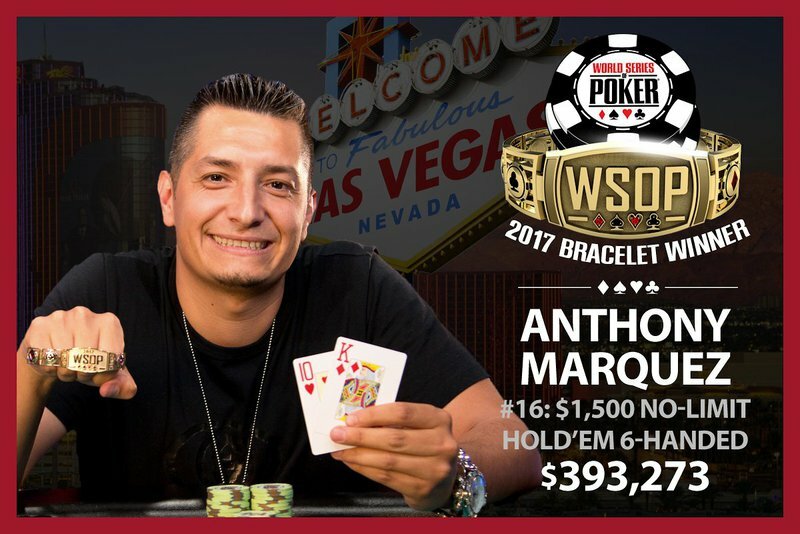 Anthony Marquez is the latest champion decided at the 2017 World Series of Poker. The Ventura, California resident topped a field of 1,748 entries to win the $1,500 six-max no-limit hold’em event, capturing the first-place prize of $393,273 and his very first WSOP gold bracelet. “This has always been a lifelong dream of mine,” said Marquez after emerging victorious. Marquez came into the final day in second chip position with 21 players remaining, but by the time the final table was set he was the outright leader. And once he moved to the top of the leaderboard he never looked back. He scored four of the five knockouts at the final table en route to the title. Marquez had plenty of tough competition joining him on day 3 of this event, including Matt Stout (18th – $20,434), WSOP bracelet winner James Mackey (11th – $26,591), Ismael Bojang (8th – $46,887), Matt Berkey (5th – $87,141) and two-time World Poker Tour champion Daniel Weinman (3rd – $170,477). Marquez scored a doubled elimination to set up a heads-up showdown with Demosthenes Kiriopoulos. He was facing two all-ins and made the call with the A K . He was up against Steven Buckner’s J J and Weinman’s K K . The board ran out 9 5 3 2 4 and Marquez made the wheel to scoop the pot and take more than a 4-to-1 chip lead into heads-up play. In the end Kiriopoulos hot his last chips in on a 10 6 5 flop with the J 10 only to get called by Marquez’s K 10 . The 4 on the turn and 10 on the river secured the pot and the title for Marques, sending Kiriopoulos to the rail in second place with $242,978. For more coverage from the summer series, visit the 2017 WSOP landing page complete with a full schedule, news, player interviews and event recaps.